This new Hubble image, captured and released to celebrate the telescope’s 23rd year in orbit, shows part of the sky in the constellation of Orion (The Hunter). Rising like a giant seahorse from turbulent waves of dust and gas is the Horsehead Nebula, otherwise known as Barnard 33. Image released April 19, 2013. "The result is a rather ethereal and fragile-looking structure, made of delicate folds of gas — very different to the nebula’s appearance in visible light," mission officials wrote in an image description today (April 19). The new observations allowed astronomers to create a dazzling video of the Horsehead Nebula based on Hubble's photos. The Horsehead Nebula, also known as Barnard 33, is located about 1,500 light-years from Earth in the constellation Orion (The Hunter). The Horsehead is a huge interstellar cloud of gas and dust, like other nebulae, and the light from a nearby star gives it a beautiful glow. The object is a popular observing target, and Hubble has taken numerous Horsehead photos over the years — including in 2001, to celebrate the telescope's 11-year anniversary. 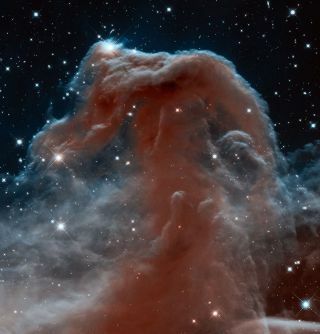 The Horsehead's dramatic pillar is made of sterner stuff than the clouds surrouding the nebula, which have already dissipated. But the pillar will disintegrate as well in another 5 million years or so, astronomers say, and the Horsehead will go the way of the dodo. The Hubble Space Telescope is perhaps best known for its photos in visible light. But the telescope's Wide Field Camera 3, which was installed by spacewalking astronauts in 2009, also takes crisp images in infrared wavelengths, researchers said. NASA's highly anticipated successor to Hubble, the $8.8 billion James Webb Space Telescope, is slated to blast off in 2018. JWST is optimized to view in infrared light.